Tomorrow is my 47th birthday, which means today is the final day of my year-long weight-loss plan. Qualitatively it was a success! I look and feel better (and I sleep better at night). Most of my pants are now too loose. I can do pull-ups, which I previously could not, and I’m the lightest I’ve been in over seven years. 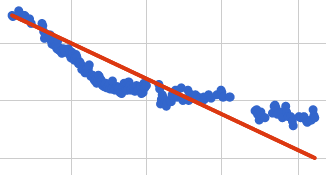 As you can see from the graph, after an exciting fast start, losing weight was a stop-and-go proposition. At Google, teams are encouraged to set measurable goals at the beginning of each quarter, and then to measure them at the end of each quarter. Scores of 100% are great, of course, but we’re taught that the ideal average score is actually around 70%. More than that and your goals aren’t ambitious enough. So maybe I should feel satisfied with my 72% (but I don’t). My bathroom scale also measures body composition. According to that scale, my body-fat percentage went from “very high” to merely “high,” and my visceral fat number went from “high” to “normal.” My muscle-to-fat ratio climbed from 1.02 to 1.38. Gratifyingly, my “body age,” according to the scale, dropped from 56 to my actual age: 47. I wish you luck…and I commend you on your efforts!